I’m very excited to share with all of you that I have been chosen to be one of Toyota’s Brand Ambassadors in their T.W.I.N program: Toyota Women Influencer Network! I have been driving Toyota cars for almost 12 years and so I am absolutely thrilled to be part of this program. Last week I had the wonderful opportunity to meet some members of the Toyota team at the L.A. Auto show and it was such a fun and informative experience. 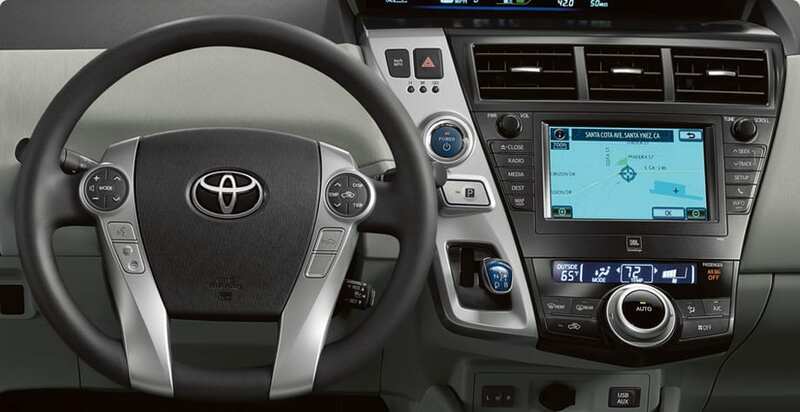 I had the chance to test drive the new Prius V and can you say, “This will be my next car!” I LOVE, LOVE, LOVE it! My husband and I just bought a Prius in October of 2010 and I love that one, but as our family grows, I can absolutely see us grow into the Prius V. It’s bigger than 80% of other compact SUVs, and the mileage on it is awesome at 44/40/42 mpg, which is city/highway/combined. Also the Toyota Prius V stays connected with you by Entune.™ As stated on the Toyota website, “Entune™ is a revolutionary in-car technology that features a collection of popular mobile apps and data services, the available Entune™ system allows you to access a wide variety of personalized content and services – all from the comfort of your Toyota vehicle.” This is so futuristic, but leave it to Toyota to be ahead of the curve! 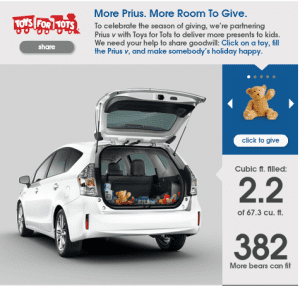 As if the Toyota Prius wasn’t great enough, right now it is partnering with Toys for Tots! Help Toyota Prius get toys to children across the USA by going to their Toyota Prius Facebook page and simply click on where it says, “click to give.” Now, how easy is that! Toyota has so many fantastic cars that I’m certain there is one just for you! I’m excited to take you on this journey with me as I embark on this new adventure with T.W.I.N!